Welcome to GiftCardsWild.com, the online resource for buying and selling gift cards, gift certificates and store credits. We are happy to offer you access to the GiftCardsWild.com site or any networks or services we operate. This is a legal agreement between the consumer (also referred to as “you” and “user”), and GiftCardsWild.com (also referred to as “us” and “we”). By using this site and by clicking “I Agree”, or by accessing, browsing, and/or otherwise using the GiftCardsWild.com service, you admit that you have read, understood, and unconditionally and fully agree to this agreement. If you do not agree to the conditions outlined in this agreement, do not use this site. GiftCardsWild.com reserves the right to modify, change, revise or update this agreement at any time by updating this page. By using the site you agree to be bound any future modifications we make to this agreement. GiftCardsWild.com is an online marketplace for buying and selling gift cards, gift certificates and store credits. Nobody wants to pay retail! That’s how we got the idea for a discounted gift cards store, so you can have a discount even when the sales are over or a better discount on Boxing Day! We are also helping to recover the unwanted, forgotten gift cards and reward people who will rescue them! GiftCardsWild.com allows registered users to buy or sell cards, coupons, codes, or the like that are redeemable for goods or services by third parties. You agree to pay all applicable taxes or charges imposed by any government entity in connection with your participation in the Service. The Service may allow you to buy Gift Cards. You acknowledge and agree that you must pay for such Gift Cards with a valid credit card, that is in your name, or debit card (through PayPal instant payments) or use existing funds from your PayPal account. GiftCardsWild.com limits the purchase of Gift Cards to only one purchase per household from every merchant every 7 days, as clearly indicated when using the Service. Failure to comply with such policy may result in the reversal or cancellation of such transaction without notice. Any user who fails to comply with the above policy, on more than one occasion, may also be subject to reversal/cancellation fee of $10 000.
g) the Gift Card is not subject to any obligations or encumbrances of a third party. h) the Gift Card is valid in Canada (all provinces and territories). 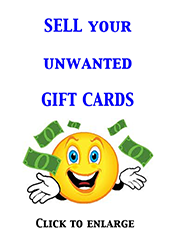 After you confirm the sale of your unwanted Gift Card you agree to transfer ownership of the Gift Card and any interest therein to GiftCardsWild.com. You agree that no portion of the Gift Card and any interest therein will be redeemed at any point after the transaction. Gift cards valued under $25.00; Invalid card(s); Cards with 0 (zero) balance; cancelled or inactive cards can be returned to sender upon request with applicable fees: Registered mail $12.00 and Administration fee $15.00, TOTAL $27.00. 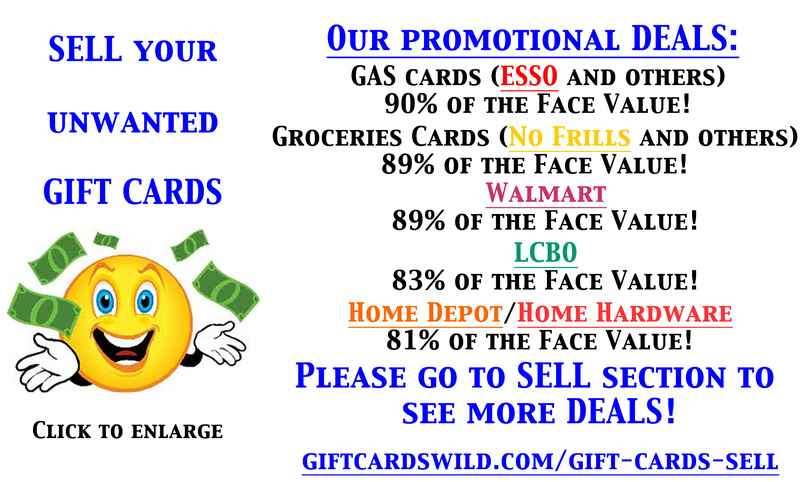 Gift Cards Wild may request photo ID front and back (driver's license or passport) at any time. Without receiving requested ID within 30 days, Gift Cards Wild will take a full possession of the card(s). 3. GiftCardsWild.com Guarantee "Lion Protection Program"
a) all gift cards are validated before the buy and sell process. b) if for any reason your gift card is not valid once received, GiftCardsWild.com will reimburse you up to $1,000 (lifetime limit). This warranty only applies within 30 days of purchase. Buyer must contact GiftCardsWild.com within the 30 days. d) all personal information of our customers is under the highest security. GiftCardsWild.com reserves the right to suspend or cancel the registration/account of any Buyer or Seller whom we believe abuses or attempts to abuse our Guarantee. We will report any suspicious activity to legal authorities. All personal information collected by GiftCardsWild.com is under protection of PIPEDA (The federal Personal Information Protection and Electronic Documents Act). The federal Personal Information Protection and Electronic Documents Act (“PIPEDA”) sets out rules and principles for the management of personal information by commercial organizations. The type of personal information that is protected includes almost any information about an identifiable individual, such as your name, address and telephone number. PIPEDA provides certain fundamental principles which apply to the collection, use and disclosure of your personal information. One of the most significant is that your personal information generally cannot be collected, used or disclosed without your consent. It also allows you to find out why your personal information is being collected, how it is being used, where it’s being stored and to whom it’s disclosed. It requires the use of appropriate safeguards to secure your personal information. It also grants you access to your personal information and provides mechanisms for ensuring compliance. GiftCardsWild.com does not collect, use or disclose your personal information without your consent except where required or allowed by law. Users agree that heir use and activities on this site will full comply with this Agreement, site policies, and all applicable rules, laws and regulations set forth by Canada governing the sale or transfer of gift cards. Information provided by users to GiftCardsWild.com must be legally accurate. Users will not impersonate any other individual(s) while using GiftCardsWild.com. For all cards and store credits you sell you warrant your description and all other information provided is accurate. If the information provided is inaccurate GiftCardsWild.com reserves the right to cancel the transaction and hold you liable for a penalty of up to $1000. The sale of stolen property on GiftCardsWild.com is prohibited by both this user agreement and the law of Canada. The contents of this website belong to GiftCardsWild.com. Unauthorized modifications, copies or distribution of the content of this site, including but not limited to, GiftCardsWild.com copyrights and trademarks without our permission is strictly prohibited. You agree that you are responsible for your actions in connection with this site. You are responsible for all attorney's fees and costs that arise out of your breach of this Agreement, violation of laws, or any of your activities in connection with GiftCardsWild.com. GiftCardsWild.com may take any action it deems appropriate in the event of a violation of GiftCardsWild.com policies or agreements or in the event of disputes and complaints. GiftCardsWild.com may issue limitations, warnings, suspensions, or terminate the service and deny access to any user at any time. GiftCardsWild.com is not required to inform you of any such action or the reason for terminations or suspensions. Your account will be terminated if you violate this agreement, do not cooperate with GiftCardsWild.com investigations, are unable to authenticate information, or if GiftCardsWild.com has reason to believe you activates are disruptive to this site. Payments owing to you for activities conducted on the site can be delayed or suspended pending investigation. Payment will not be made if an investigation reveals that unlawful activity or activity that violates this agreement has occurred. Registered Users are members of the site, meaning they have submitted their account information to GiftCardsWild.com. Registered Users must agree to the terms and conditions outlined in this Terms and Conditions Agreement. You may only use this site and its services if you are a resident of Canada and able to form legally binding agreements. If you are not over the age of 18 you must get your parents to sign up for an account and accept the user agreement, only they may act on your behalf on GiftCardsWild.com. If you reside outside of Canada you are not eligible or permitted to use this website or any of its services. You may not buy or sell gift cards on GiftCardsWild.com if you do not meet the above requirements. We will not accept any request from you to buy or sell gift cards if you have not registered with us. For registration, you must provide your current and legal first name and last-name, e-mail, your current address, postal code, country, and city. Users also must select a password. It is the user's responsibility to maintain the confidentiality of their account information. A person must have only one account registered on the website. One is not allowed to register more than one account on the site. Failure to comply with such policy may and will lead to account suspension. GiftCardsWild.com reserves the right to modify or discontinue this site or any part of this site at any time without any warning. GiftCardsWild.com does not guarantee uninterrupted service and is not responsible for any hardships you suffer when the site is down. You agree that we are not liable to you or anyone else for any suspension, discontinuance, or modification to this site or any other site maintained by GiftCardsWild.com. *Registration for the province of Quebec is temporarily unavailable.